Group Fitness at the Y offers many options through group fitness classes and special program classes. Attending classes with others who are motivated to get fit and have fun inspire you to keep healthy and try something new every time you come into the Y. The Y offers more than 180 drop-in classes a week that are FREE for our members! Drop-in classes are just what they read - no registration or sign-up required. These classes include Zumba, Group Cycling, Yoga, Pilates, TRX-Suspension Training, Cardio Kickboxing, Water Exercise, Strength Training, and more! Each and every one of the Y's group fitness classes are led by a certified and trained fitness instructor. Classes welcome all levels and abilities 14 years and older. 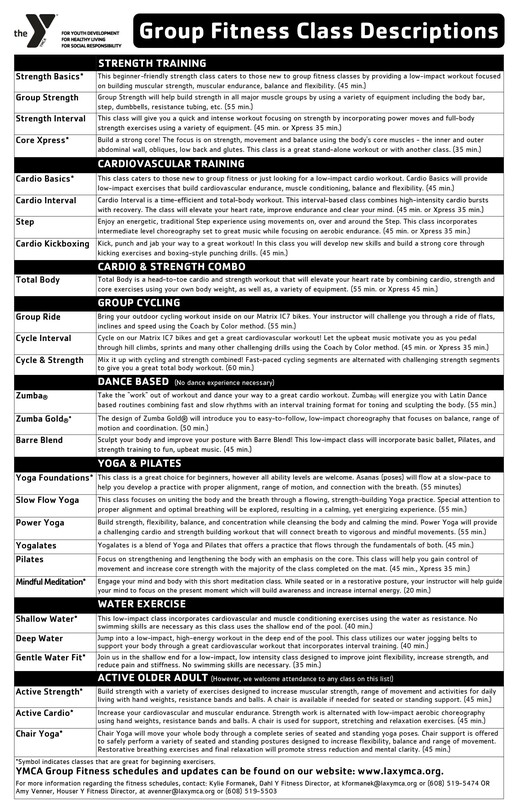 Here at the Y, you're sure to find a class to fit your interest and fitness level. Working out in our Group Fitness Classes provides members an opportunity to reach personal goals, make friends and be active. Click the image below to read "Healthy Living at the Y"